There is one site on the web that every automotive marketing industry person should frequent regularly and that is the Automotive Digital Marketing site. There are some real gems out there, as the above video uhm... proves. Okay, it proves that progress is an elusive thing and that local TV production hasn't evolved much in thirty years, but if you want to see what is "viral" in dealer videos you will find it on the site. Silly videos aside, what is great about the Automotive Digital Marketing site is that you get a look into the struggles, marketing efforts, and insights of dealerships across the country. I find a lot of the discussions quite interesting and the use of video is sometimes educational, compelling, and baffling. 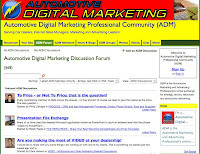 The ADM Forum is where a lot of the learning and insights exist on the site. Dealers engage in a range of topics and share their experiences and even strategies. It's a really well done area with a solid community following so you know there is some critical mass from those who are regulars. Basically, the site is an excellent resource and probably the best resource on the web for getting a dealer perspective. It's the automotive dealer equivelant to the marketing industry's Ad Gabber site. I highly recommend joining the community if you are interested in what is happening at the Tier 3 level.